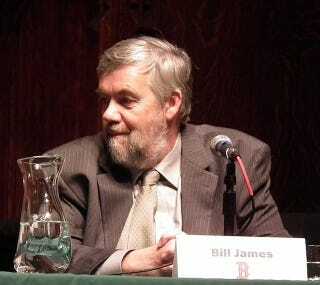 Bill James, ever the contrarian (he even took a go at disputing climate change a few years back, though later softened his stance), has been taking the unpopular stance on Joe Paterno this week. First it was him saying in an online chat that the Freeh Report made it clear that Paterno did enough to address the Jerry Sandusky situation. Then, on the radio, James declared that Paterno was not as powerful as we all thought, did not have any allies at Penn State, and that the media's trying to blame everything on Joe. People got upset. (Not Rob Neyer, who wrote a defense of James, including an odd sarcastic comment about pulling down statues of Jefferson and Churchill if we're going to remove Paterno's statue. Well, James doesn't have to answer to anyone. This is America, and we have free speech. But we also have bosses! James is a Red Sox employee, and in a statement released on its Twitter account, the team has admonished James to keep his comments to himself. "Red Sox Owner John Henry & GM Ben Cherington spoke to Bill James regarding him making public his personal opinions on Joe Paterno. In that call, Mr. James was informed that his comments in no way reflect the opinions or positions of the Red Sox. Because Mr. James is perceived as representative of Red Sox, he was asked to refrain from further public comments on this matter. " And so we enter the inevitable next stage of any burgeoning conspiracy theory: Paterno Truthers claiming the mainstream is trying to silence them.